Rabné (Skt. pratiṣṭhā, Tib. རབ་གནས་, Wyl. rab gnas) — the practice of consecrating representations of enlightened body, speech and mind. During a Rabné practice, we direct our prayers and focus our meditation, employing visualization and mantras, in order to invoke the blessings of all the buddhas and enlightened masters, so that they are drawn irresistibly through the force of their compassion, and merge inseparably with all the sacred objects. As they infuse them with their blessings, we consider that the images are empowered, and blaze with even greater splendour and magnificence. Then we pray, again and again, that the buddhas may remain one with them forever, bringing benefit to beings for as long as the elements of earth, water, fire and wind endure, and always radiating auspiciousness and wellbeing, so that whoever encounters them may enjoy good health, long life and prosperity, and ultimately gain complete spiritual awakening. Since the buddhas are embodiments of boundless compassion, if we make an image of a buddha and prostrate before it or make offerings to it, the result, the purification of our obscurations and accumulation of merit and wisdom, will manifest based on the power of the buddhas’ compassion. The buddhas generate the vast mind of bodhichitta and vow to work exclusively for others’ benefit, and, as a result of this, they gain this quality, which means that whoever makes a representation of their form and makes offerings to it or pays homage to it, will accumulate merit and wisdom. Yet it is entirely up to us to make use of this quality, because the buddhas themselves are completely beyond these concepts. It is a little bit like electricity: there might be electricity in a certain place, but unless we turn on the switch, we cannot make use of it. If we don’t understand this point, then making offerings to the statues and images of the buddhas might not be so meaningful. 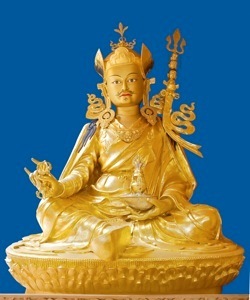 When we make an image of a buddha, whether peaceful or wrathful, as a support for our samaya, and then invoke the wisdom deities themselves through visualization and mantra so that they enter into it and transmit their blessings, it becomes an incredibly powerful basis for the accumulation of merit. This process is what we call rabné, or consecration. ↑ Excerpt from an oral teaching given in Lerab Ling, on the 26th July 2006. Padmasambhava & Jamgön Kongtrul, The Light of Wisdom, Vol. Three, translated by Erik Pema Kunsang. This page was last edited on 10 February 2018, at 00:43.